Science Series: The Myth that the Church Hindered the Development of Science | Is Christianity True? “The conflict between religion and science is unavoidable. The success of science often comes at the expense of religious dogma; the maintenance of religious dogma always comes at the expense of science.” –Sam Harris, chief executive of Project Reason, a non-profit that promotes science and secularism. “I personally feel that the teaching of modern science is corrosive of religious belief and I’m all for that. If scientists can destroy the influence of religion on young people, then I think it may be the most important contribution that we can make.” –Steven Weinberg, Nobel prize winning physicist of the University of Texas. These be fighting words! Notice that Weinberg states that the most important contribution of scientists is not the mastery or understanding of nature, but the destruction of religion. In this post in the Science Series, I want to address the myth that the Church has hindered the development of science. In fact, the previous post on the Galileo affair and the flat earth are all part of the attempt to present the idea that science was hindered by the church. 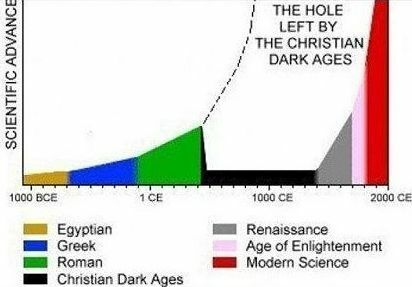 A while back I found the following diagram (below) demonstrating that Christianity hindered the advancement of science. That if it wasn’t for the church science would be much more developed than it is today. This is a commonly held notion that anyone would run across online or in our culture at large. This is also common amongst academics as well. Robert Wilson in his Princeton University published book Astronomy through the Ages states that the “commitment to Holy Scripture was, and still is, the fundamental basis of Christianity, but there is no doubt that it was a discouragement to scientific endeavors and these languished for a thousand years after the military fall of Rome.” (p. 45) The original Cosmos series hosted by Carl Sagan provided a timeline of the development of science in which a thousand year period was left blank during the Middle Ages with the caption “a poignant lost opportunity for mankind.” Henry Williams book Great Astronomers dramatically illustrates this myth by having the medieval chapter consist of two biblical epigraphs followed by several blank pages. The history is quite different from these passive aggressive attempts to slander Christianity with the idea that the church attempted to suppress science. In fact, the conflict thesis was invented by John Draper in his book History of the Conflict between Religion and Science (1874) and catapulted into popularity by Andrew D. White’s A History of the Warfare of Science with Theology in Christendom (1896). 5. Richard of Wallingford (14th cent.) – mathematician, astronomer, designed an astronomical clock, calculated the lunar, solar and planetary longitudes, predicted eclipses. 6. Roger Bacon (13th cent.) – an English philosopher and Franciscan friar emphasized the study of nature through empirical methods and observation. A. N. Whitehead of Cambridge University and later Harvard University, communicated in Science and the Modern World that “faith in the possibility of science, generated antecedently to the development of modern scientific theory, is an unconscious derivative from medieval theology.” Genesis chapter 1 states that when God created the world he called it “good.” If it is good then it is worthy of study. The Christian worldview provided the philosophical underpinnings necessary for science to develop. C. S. Lewis, in Miracles, states that “men became scientific because they expected Law in Nature, and they expected this because they believed in a Legislator [God].” This theological foundation is one of the reasons science developed in Christian Western Europe. Other worldviews say the physical world as an illusion, or at best a lesser reality. The church has given more money to science that any other institution. It funded (and continues to fund) universities. The Vatican has its own observatory. Every time someone puts money into an offering plate at a church today, it supports science. A portion of that money goes to the denomination of that church, they in turn give it to a university, and all the Christian universities in America have science buildings, science departments, and scientists. Wheaton University’s Meyer Science Building cost $69 million to build and has a $11 million endowment. Baylor University’s new Science Building cost a $103 million to construct. Who would have thought. Every time a Christian tithes they are supporting science. The idea that the church hindered science is far from the truth: the church has historically, philosophically, theologically, and financially supported science. It always has and it looks like it always will.